Plaque commemorates the personnel who served in 33 Squadron during World War Two. 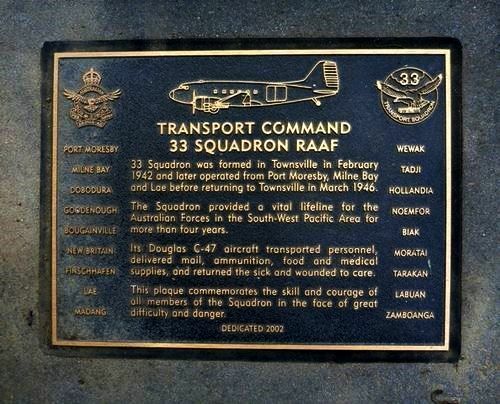 33 Squadron was formed in Townsville in February 1942 and later operated from Port Moresby, Milne Bay and Lae before returning to Townsville in March 1946. The Squadron provided a vital lifeline for the Australian Forces in the South-West Pacific Area for more than four years. Its Douglas C-47 aircraft transported personnel, delivered mail, ammunition, food and medical supplies, and returned the sick and wounded to care. This plaque commemorates the skill and courage of all members of the Squadron in the face of great difficulty and danger.